NOW lower the nose." I push the transmit button: “Allerød Radio, Oscar Golf November on final runway 1-6”. My brain is completely overloaded. Carburetor heating on, engine at 1500 RPM, flaps to first position, keep the airspeed steady at 85 MPH, flaps to second position, speed down to 80 MPH, flaps in third position, carburetor heating off, speed down to 76 MPH. Flare. My hands are wet. "We’re too high, go around, GO AROUND." Full throttle, fly the aircraft, flaps to first position, fly the aircraft, wait till speed is back to 89 MPH. Pull back the stick. OY-BGN climbs back towards the friendly skies. It was last year I abandoned all my savings goals. My colleague Thomas had asked me if I was interested in taking a Private Pilot License (PPL) with him. Of course I was, and after two trial lessons we were both addicted to flying. Finally my childhood dream was coming true. The theory lessons started in the end of October, 1995. All of our spare time in the dark months from November to February was used only for theory lessons, aviation discussions and flight simulator programs on the computer. The theory lessons in the flight school were divided in 24 lessons of 3 hours, two lessons each week. Becoming a pilot is not just learning to fly the aircraft, you can get monkeys and computers do that. 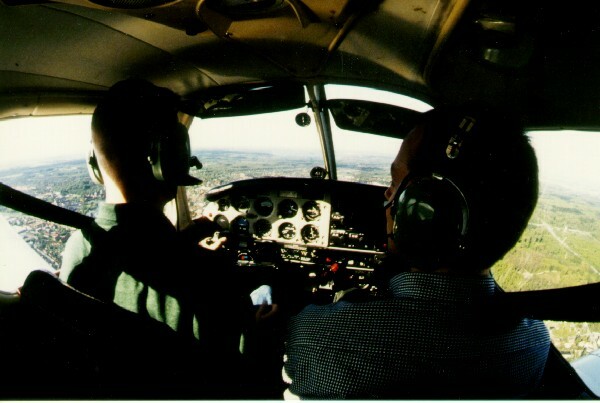 The pilot needs to know why the aircraft is flying (aerodynamics), how to find your way around (navigation), how the weather will develop (meteorology), how the controls and the engine in the aircraft are working (flight controls and engines), flying regulations and how to communicate on the radio. I didn’t pass the theory exam on the first try. Wired enough, I failed the easiest subject of them all, perhaps I concentrated on the more difficult ones. But I graduated the following month, and the airways opened beneath my feet. “Allerød Radio, Oscar Yankee Bravo Gulf November aaaahheeemmmmm radio check on 122.22” It was March, 19th 1995. My very first flight lesson. At this moment in time, I realized that everything I learned during the last couple of months in some mysterious way had disappeared from my memory. Chief instructor Morten Walter looked hopelessly at me: “Engine test, engine test”. 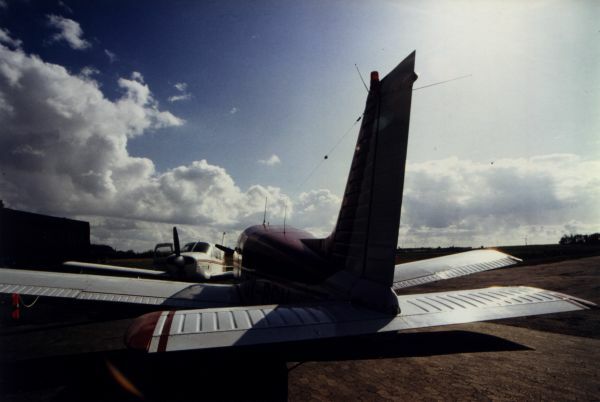 “Allerød Radio, Oscar Gulf November taxing to the end of the taxiway for engine test”. Engine test. Checklist. Seat belts fastened. Ready for departure. I looked nervously on Morten, who probably could read my thoughts. 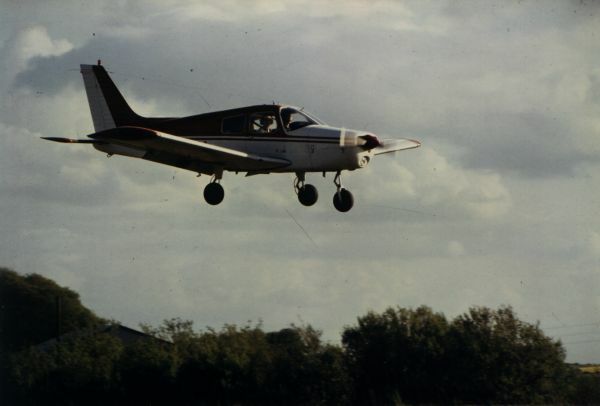 “It’s not me who’s learning to fly” he said “Just call up on the radio at tell them your about to takeoff, add full throttle, rotate the aircraft off the runway at 60 MPH, and keep it in the ground effect until we reach best rate of climb”. While we were rolling down the runway and the speed increased, I became more and more convinced that we’d both do better with “Top Gun” on video. How would I ever become a pilot, if I couldn’t even hold it on middle of the runway ? The aircraft zig-zagged nicely down the runway, rapidly increasing the swing to both sides. When the aircraft finally decided to change its heading from the runway directly towards the nearby highway, Morten saved me over the headset: “Of course, we could also drive around the rest of the day”, he said, with a hidden hint to pull back the stick. OY-BGN changed it’s course from the highway to the mighty blue sky. As a private pilot, you need to get a medical exam at regular intervals, but it’s a very good idea to get the first one before you start at school. The medical is focused on eyesight, balance and heart functions, but most healthy people will pass without any trouble. 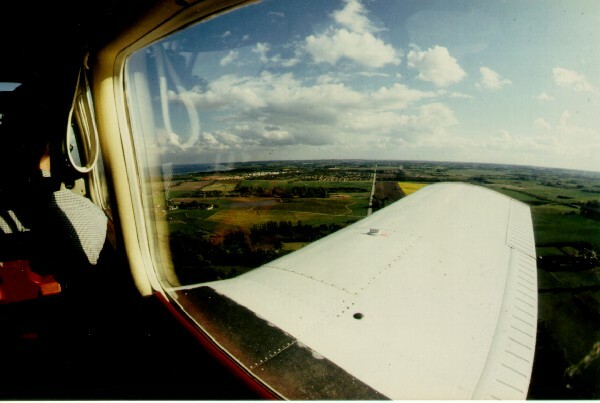 The pilot is allowed to use glasses or contact lenses, as long as a spare set of glasses are brought along. “Isn’t it dangerous?” friends keep asking me. Well, yeah, it unbelievably dangerous, especially if you haven’t done your homework. Otherwise it’s very, very safe. The small single-engined airplanes are inspected for every 50 hours of flight, and a larger inspection occurs every 100 hours. Most accidents are caused by pilot mistakes, so the Danish Civil Aviation Administration changed the minima a few years back. At least every second year, the pilot has to take a PFT (Periodic Flight Training), and the pilot needs to fly at least 10 hours every year, or take an additional PFT. The PPL changes the pilot’s ordinary life as well. If he or she is taken for driving drunk or other criminal actions, the pilot license might be withdrawn. “Can you find Allerød by yourself” crackles in my headphones. Second flying lesson. We’re located somewhere above North Zealand, Denmark. My two cerebral hemispheres - the abstract and the logical - are both working on possible solutions, but lucky enough they agree to the same answer. If you think the theory is hard - and most students do - it’s nothing compared to an actual flight. In the beginning, it feels like something between extremely difficult and absolutely impossible just to keep the airplane straight and level, and even before you’ve learned that, you’re supposed to find your way around by yourself. The problem is that all towns and cities look exactly the same from 1200 feet. It’s not so strange for students get lost from time to time, and not to have a clue as to the right direction. 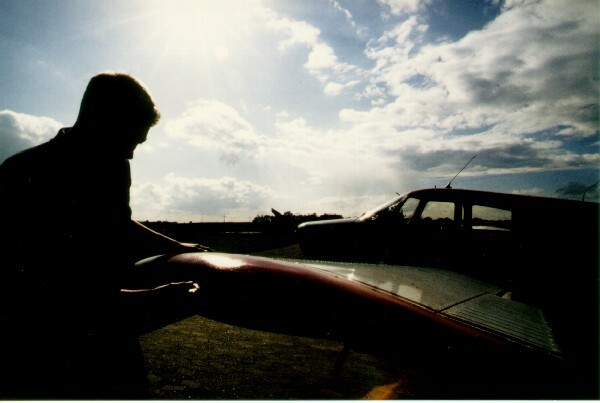 When you’re good enough, which normally is after some 12-15 flight lessons and 60-80 landings, you will be sent on your first solo flight - that is without your instructor. The first solo flight is short. Takeoff, round the pattern and down again immediately, so you don’t get lost. But hereafter you fly better and better and on longer and longer journeys. Finally, you can fly from one end of the country to another, all by yourself. After at least 40 flight hours, including 15 solo hours, you’re ready for the exam. The examiner from the Civil Aviation Administration is being invited for a flight with you as the captain, and if your flying is good enough, your dream will come true. You’re a pilot, with license to fly. But for me there’s still some way to go. “The most important thing is to know if you should land or go around.” OY-BGN is again straight and level after the erroneous approach to runway 16. Morten smiles. With more than 4000 hours, he’s able to fly blindfolded. For me, with only 4 hours of air time, the landing equals total adrenaline consumption. The second try goes better. I got that 1000 kilo (2000 punds) aluminum bird reasonable down on the 900 meters (2700 feet) long runway on Allerød Airfield, north of Copenhagen. “Good work, Martin. Next time we’re going to Roskilde Airport to train landings. Don’t forget to pull up the flaps, before we reach the apron”.